Another month another Rocksbox! 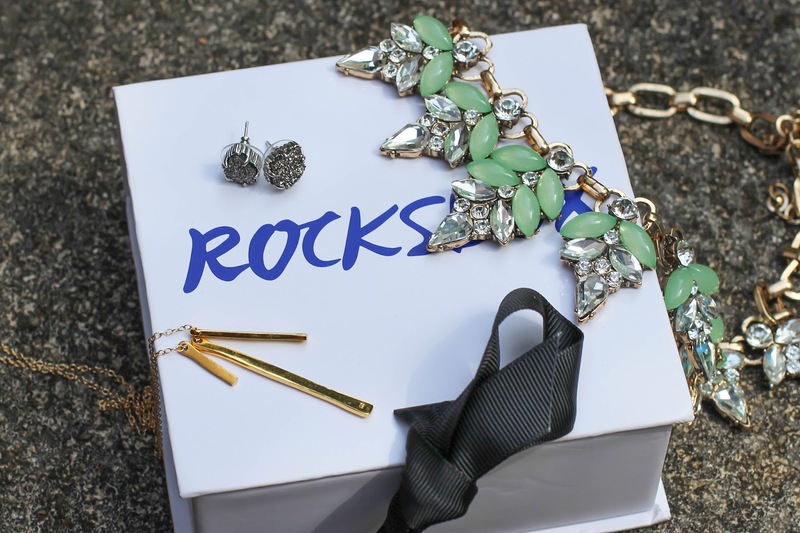 I so look forward to the day I receive my Rocksbox every month. In case you haven’t heard, Rocksbox is a subscription jewelry service that costs $19 a month and sends you 3 designer jewelry pieces on loan more the month, and if you want to keep any of them you can buy them at a really awesome discounted price, and they give you $10 towards purchasing any of the pieces in your box. You get to add pieces to your online wishlist and request certain ones from your stylist. Interested in trying it but don’t want to pay anything until you know you’ll love it? Try your first month for FREE with the code “cervinoxoxo“. I try not to peek online and ruin the surprise so it can be even more exciting when I open it, and this month I actually succeeded in not peeking! The box arrived while we were in New Jersey so it was a fun treat to open it when we arrived home and I was mostly thrilled with what I saw inside. What first stood out to me were these Kendra Scott Tessa Silver Stud Earrings in Platinum Druzy that were on my wishlist. I don’t have a ton of stud earrings, in fact I mostly just wear pearl studs, and would love to change things up more often which makes me really love these. They are simple, don’t stand out too much, but have just the right amount of sparkle to really stand out. They retail for $65 but Shine Insiders can buy them for $52 and with my shine spend they would be $42. Not terrible, but that still seems like a lot to me especially for a pair of studs. Although they are Kendra Scott. Hmm… decisions, decisions. it for $54. The next necklace is a simple and dainty long gold one, the Gorjana Pressed Taner Long Necklace. This necklace retails for $95 but Shine Insiders can purchase it for $76. I do have to admit here that there were a couple of things this month I was bummed about, which hasn’t really happened before with Rocksbox. First, I requested a bracelet this month. I specifically requested a Kendra Scott bracelet. I’ve never before with Rocksbox made a specific request and not received it. I thought if they didn’t have any Kendra Scott bracelets in stock they would send a similar bracelet of another brand but nope. Second, the two necklaces are both similar to items I’ve received in my last two boxes and kept. The green necklace is very similar to the mint one from my June box, and the gold one reminds me of the long gold simple necklace I received in May and still wear all the time. Overall, this is a great box! If this was my first Rocksbox I would be thrilled – but just based on my last few boxes there’s not much I’m considering keeping from this box, although I’m loving playing with the pieces for the month. The two necklaces are definitely out since I have such similar ones, but the earrings are definitely still a consideration. Don’t forget that if you want to give Rocksbox a try for yourself use the code “cervinoxoxo” and pay nothing your first month. Okay so help me friends. Should I keep the earrings or send them back? I'm so glad you explained how Rocksbox works—I realized I never knew exactly how it worked! What a fun box to open every month! Of course! It is so fun! Let me know if you have any other questions! I have really thought about getting the Rocksbox because I need more jewelry, but do you think it is worth the money? If you love jewelry and being pushed outside your comfort zone sometimes I think it is! The way I see it if you buy one piece of jewelry from your box and assume that it is $9 discounted from retail price (almost all of them are at least $9 under retail) and then get the $10 credit towards a piece that makes it worth it right there. Pretty much every month there has been something from my box that I've ended up keeping. With so many designers that I love (like Kenra Scott) it makes sense to me! I love the earrings, but I agree $42 is a lot for studs. If you don't have many it may be a good investment! I do find it odd that they sent you two necklaces, aren't the boxes specifically created to style together? I love the Gorjana necklace but that seems quite pricey too! Sometimes they pair pieces that go together well sometimes they throw in things that don't go together but that they think you'll like both of, it just depends! Yes the Gorjana necklace is way out of my price range haha! I like your pieces for this month! I got Kendra Earrings in mine this month too and will probably purchase them! We also got the same necklace! Not my favorite, but it's cute. And that statement necklace is super super cute, love it. Isn't it so fun? I kept the last pair of Kendra earrings I got… wish I could decide on these! My favorite part about this post was your honesty in your review of RocksBox. So many times I read bloggers reviews of products and they are all "It's so great! so great so great!" But that's not actually helpful, it's helpful to hear an honest assessment- so thanks! I always try to keep it honest! I'm generally easygoing and like most things but I'm going to point out where there are flaws 😉 I know – I hate reading about how great things are from other bloggers when you know they have an incentive to say that… especially when they say how great a box is when they send back everything!